The Innerpeace Quiltforter is the ultimate lightweight blanket made from 100% cotton flannel and Warm & White®. The Quiltforter is 45" wide and 88" long. 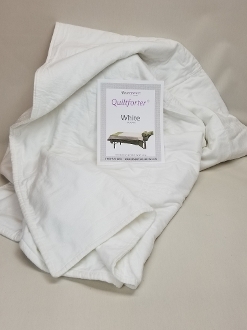 It is available in all standard Innerpeace Colors.The Quiltforter is a custom manufactured quilt/blanket made specifically to be used on massage and therapeutic tables. The Quiltforter features our signature 100% cotton flannel fabric with a layer of Warm & White® quilted and finished to provide for a cozy and relaxing experience for your clients.